One thing we asians will never get is Halloween. What exactly are we celebrating? Why do we have to knock on doors screaming "TRICK OR TREATS!!" only to recieve a handful of candies? Unless someone gives me a Sound Blaster X-Fi Notebook when he chooses treats or this would be a festival I won't even attempt to understand. Haha. Fortunately, with every holiday comes great savings with Creative. Both Creative UK and US are having Halloween Specials this week! Creative UK - FREE shipping on 22 October only! 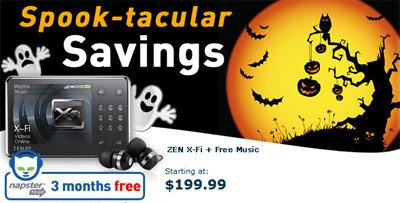 Free 3 months of Napster-to-go with every ZEN X-Fi and Mozaic purchased.